Note: I tried to avoid spoilers the best I can, but just couldn’t do it without revealing at least a minor portion of it. So, here’s a spoiler warning. Yuki is a student of Megurigaoka High School, and also a member of the school’s “School Life Club”, together with fellow club-mates, Kurumi, Yuuri, Miki and their club supervisor and homeroom teacher, Megu-nee. Yuki loves her school a lot and enjoyed chatting with her friends and participating in activities with the School Life Club. Although, is this joyful environment a reality? Or something she subconsciously conjured as an illusion in her head? While this anime looks fluffy and slice of life-esque, it is also a zombie anime at heart. Episode 1 of the anime, in particular, revealed this twist in a very subtle manner, which very effectively hooks curious viewers into coming back to the show. That, and episode 4 was another brilliantly-produced episode. But either way, episode 1 served as an excellent introduction too to depict the group’s status quo. 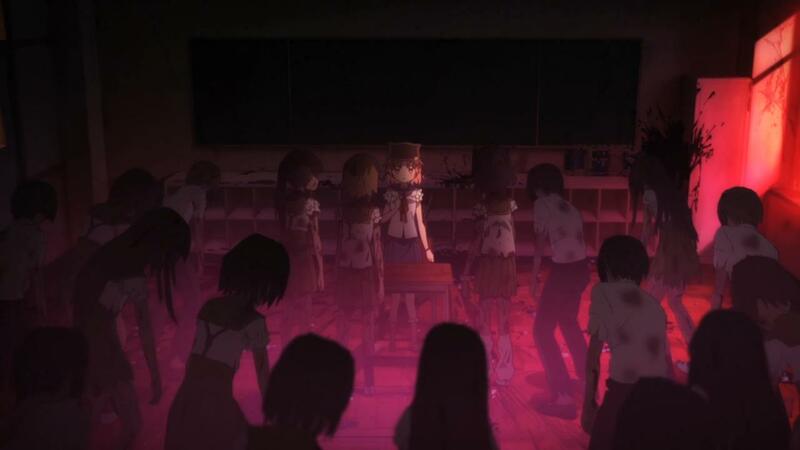 After that, the anime went in a more non-consecutive story approach to dive into the “meat” of the story, so to speak-just before and during the occurrence of the zombie outbreak, from the different characters’ point of views as it was happening, and how they meet together as a group; and finally develop the story again from the status quo about halfway through the show. 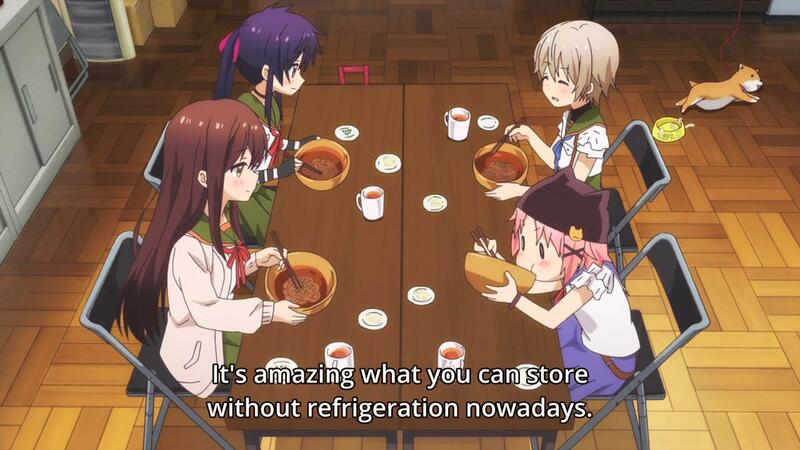 It’s an interesting approach, and Gakkou Gurashi implemented the approach seamlessly. This also helps us gain an understanding on the characters’ thoughts, motivations and personalities. 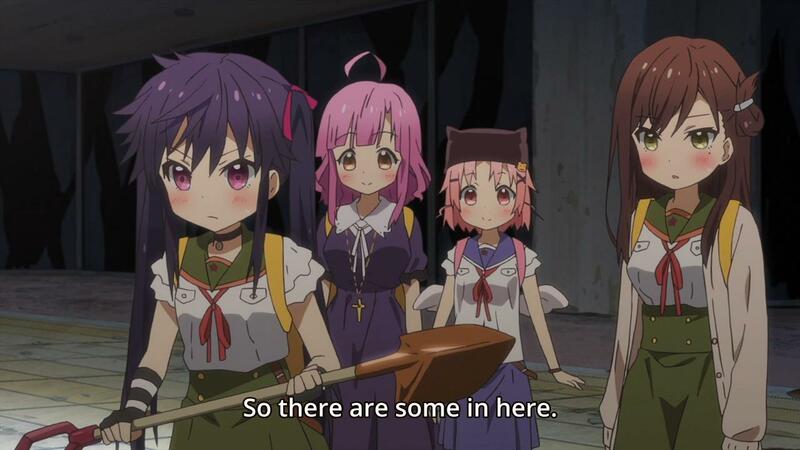 I think as far as atmosphere goes, Gakkou Gurashi nailed it to perfection. The juxtaposition between characters’ cute designs to the harsh, cruel environment effectively helps bolster the sympathetic feeling for the characters. The anime also relies a lot on slow developments and foreshadowing along the course of the story to heighten curiosity and suspense, again, something the anime executed perfectly-the mystery’s slow build up will certainly keep you coming back for more. Something which viewers might not sit well with are the slice of life/cute girls doing cute things moments, which at times, occurred in between serious moments. 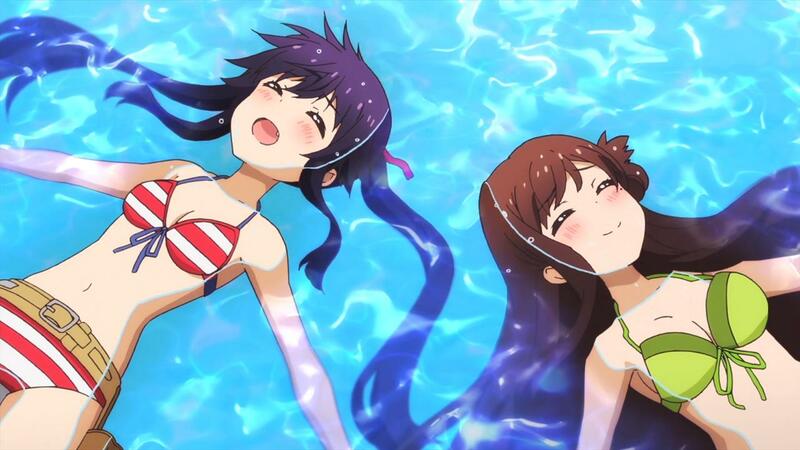 I’m mostly fine with it though, since aside from being a zombie anime, this IS a slice of life anime as well. As an aside, this also helps bolstering the emotional appeal a lot too, since having relaxing and happy moments in between makes it even more feels-inducing once the serious, heart-wrenching moments arrive. Diving into the characters a little bit more, they already have specified roles by episode 1, but it’s nice to see how they /got/ to their roles by seeing what transpired in subsequent episodes, which goes back to my earlier discussion about how this “helps us gain an understanding on the characters’ thoughts, motivations and personalities”. With Kurumi acting as the physical deterrence, Yuki acting as the mental support (ironically, her delusions actually helped) and Yuuri who managed their food, electricity and other resources. It was extremely interesting to see how they function as a group in the face of the zombie adversary, mostly in Miki’s point of view as she joined the group a little later. The way Yuki’s character is handled is also interesting, while we are introduced to the anime in Yuki’s perspectives where everything is colorful and looks normal, subsequent episodes disconnect us from that perspective-often times, it just seems like Yuki is in her own world, not feeling the least bit disturbed with her surrounding, while the other characters (and you) had to play along with her delusions. 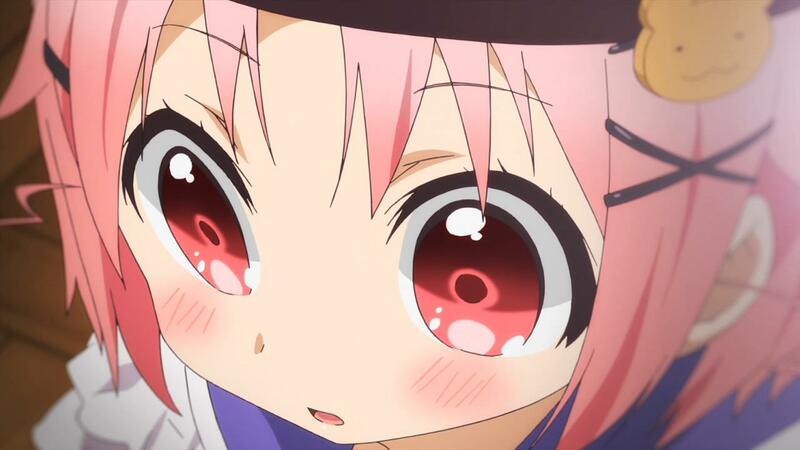 Megu-nee is also one of the most interestingly-written character in the show, who mostly act as a supporting character and also a catalyst for some of the characters’ developments in the main group. As far as visual goes, the character designs are definitely cute, for one, since this IS a slice of life/cute girls doing cute things show. Despite so, I think the grotesqueness of the zombies were able to conveyed decently enough, although when the scenes cut to the zombies, sometimes images will be extra blurry and shadows will be extra darker to conceal the zombies’ faces and so on. This interestingly enough create an impression of fear psychologically, by slightly concealing visual ugliness, and the creepy, eerie music in the background just accentuate the wonderfully-executed atmosphere. 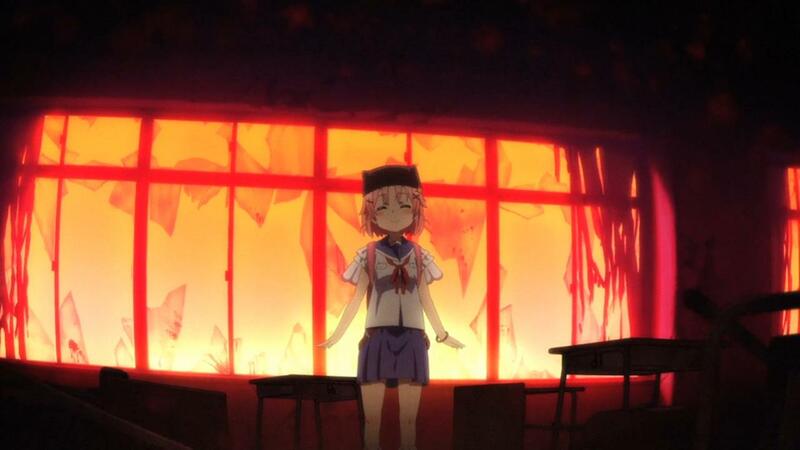 In addition, the school backdrops look dull and monotonous, and also designed just like in a zombie apocalyptic environment-torn walls, broken glasses, messy, etc… Interestingly, whenever we are in Yuki’s point of view, her delusions showed more colorful backgrounds, and the building is interpreted to be more in order instead of looking like the place had been blown by a typhoon; sometimes even accompanied by imaginary students. 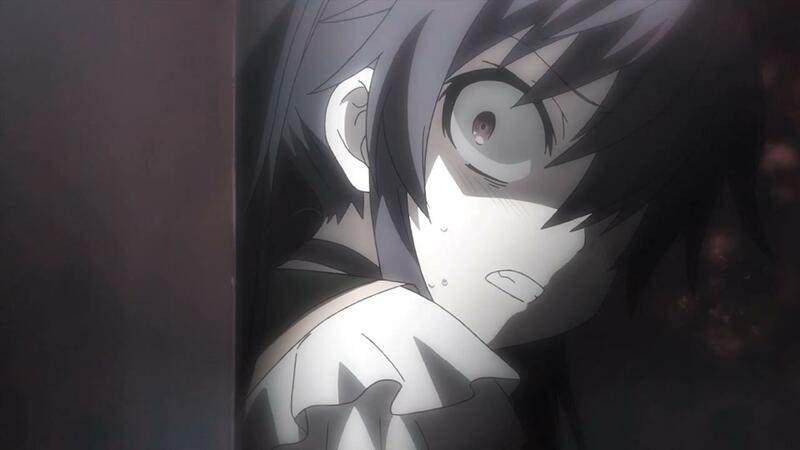 In later episodes, the anime had showed the backgrounds more in it’s “realistic” state than in it’s delusional form, however, but the fact that Yuki still acts like everything is normal really reinforces the idea that something is wrong-a psychological disconnect that breaks the viewers’ immersion. The slight changes to the OP and ED every episodes as more shocking revelations are revealed are also a brilliant way to show progressions to the story. Matching the mood swings between cuteness and darkness, the music fittingly shifts to a more serious, dramatic mood whenever necessary, bolstering suspense for the viewers. There are also bittersweet moments where piano pieces or music box-themed songs are played, which nicely accentuated the emotions. Last but not least, there’s that jazz music track too, which is one of the best song in the series, but also effectively inserted into the anime. Other than that, the rest of the music during the slice of life moments are decent in their roles, acting as the accompaniment for the girls’ activities, but when compared to the rest, fairly forgettable. 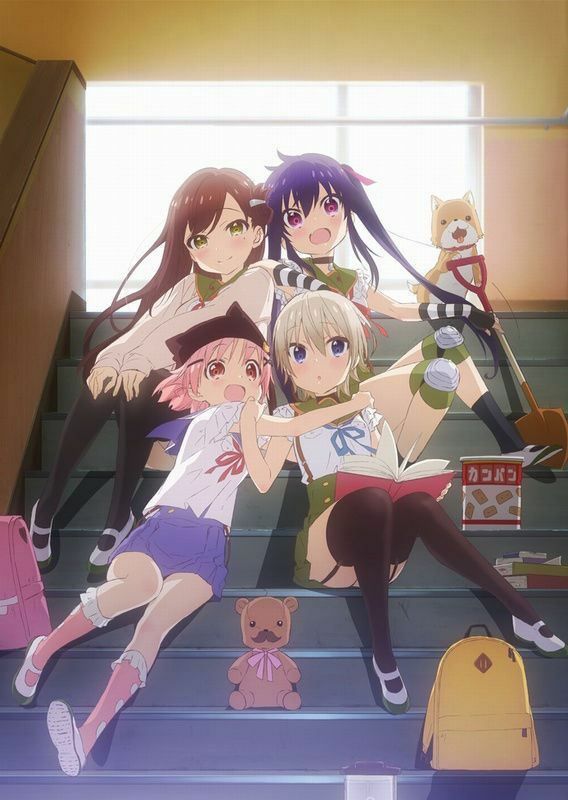 Gakkou Gurashi’s biggest appeals is the way it relies on “contrast”; whether how the characters’ cute designs contrasted with the harsh setting, whether how the sweet-sounding melodies of some BGMs contrasted with reality, and how some happy and relaxing slice of life moments contrasted with the serious, intense moments-the anime is constantly contrasting itself between a sweet, fantastical escapism or facing a hard, cold reality. 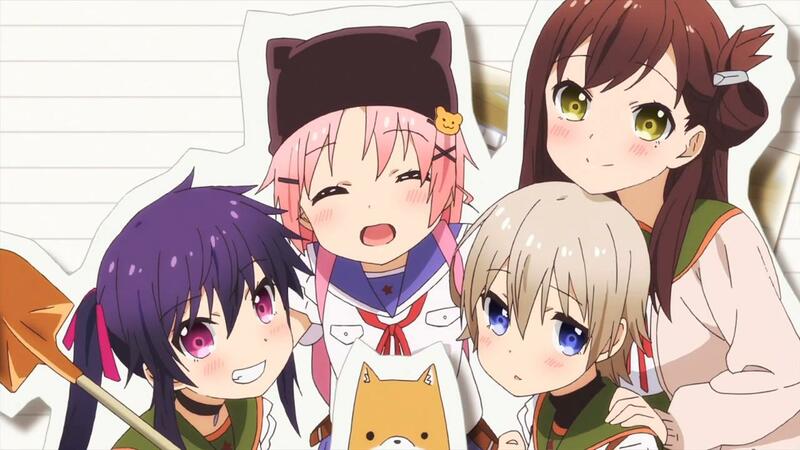 All in all, Gakkou Gurashi is a nice surprise for me in this Summer lineup, and is my favorite anime of the season, and could be even a close contender for the anime of the year. I love this anime!! kurumi is so badass!! This was a great and very emotional anime, near the end it was very touching. I never noticed Megu nee’s problem until it became obvious, I was puzzled that I didn’t noticed it before, maybe I could not accept it deep inside. Yuki was a bit too carefree at one point I believed she was mentally challenged. Although after certain heroic acts I accepted her antics. I enjoyed the SOL scenes a lot, it made me cheer for each character and the doggy, too ^^ They also dapted the Zombie atmosphere very well. Yea, it’s like a real “graduation” at the end, brilliant ending. I was spoiled by MAL early on regarding that, lol. The guy who made that comment about Megu-nee said that he’s just speculating, but there’s a possibility he’s read the manga and is just trolling with people, I don’t know. It was pure escapism for Yuki just to help herself stay sane. The SOL segments are certainly a nice contrast, yea, makes it easier to get behind the characters rather than just zombie-fighting 24/7. High School of the Dead went with a more stereotypical zombie route with all the action. Noting wrong with that, though the ecchiness certainly isn’t necessary, or at least, should had been toned down some more since it ruins the seriousness a lot. I kinda wish they would make it have less uguu in it and more of the plot. It’s actually pretty interesting when they get down into the action, rather than girls doing cute things and cute stuff. I don’t mind moe, but I kinda wish they would prioritize more in the action and plot advancement. It’s an aspect of the anime which will forever be an arguable element. I’m mostly fine with it, since the slice of life builds up the contrast and characterization-and of course, this anime is a slice of life in it’s purest form too. It’s a great contrast but I can see why some wouldn’t agree with it.